Christmas may have come and gone, but the New Year is on the way. Now's no time to power down! Whip up this incredibly tasty batch of pure goodness that's also oh-so-nourishing! It's all the snacky yumminess of rice crispy treats but with a modern twist, achieved by the delectable additions of peanut butter and our scrumptious Plant Protein. 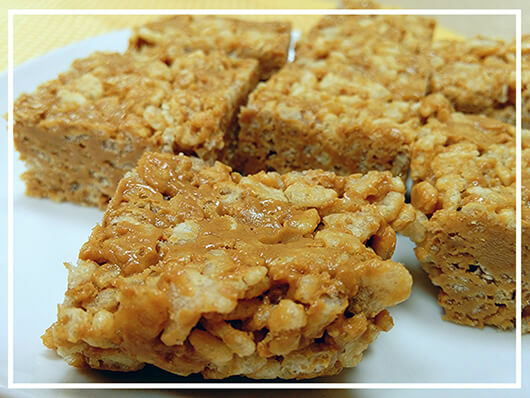 Launch into the New Year with newfound energy from Protein-Infused Crispies! 1. Grease a 9-inch by 9-inch pan with coconut oil or line with parchment paper. Set aside. 2. In a medium bowl, mix together melted peanut butter, brown rice syrup, protein powder and vanilla until it forms a dough consistency. 3. Gradually add brown rice crisps to the peanut butter mixture. Use a spatula or your hands to gently fold the rice crisps into the mixture. Then, pour mixture into the pan. 4. Using a spatula, spread mixture out evenly and press into pan so the bars are compact. 5. Place into freezer for at least 30 minutes. 6. Before serving or storing, use a sharp knife to cut your treats into squares. Coat the knife with a thin layer of coconut oil to prevent sticking. Brown rice syrup provides essential stickiness to the recipe’s texture. In a pinch, you can substitute a mix of honey and molasses at a ratio of 3:1. Recharge your New Year energy reserves with this extraordinarily yummy recipe from our in-house culinary specialist!